Join Us for One or More of our Spring Events! 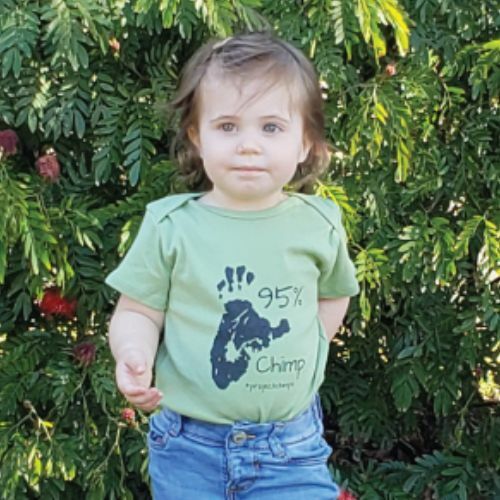 Project Chimps Onesie for $20! It is interesting to ask someone “what is sustainability?” Every person you ask will offer a different explanation of what it means to them. Broadly, “sustainability” is the need to create environmental, economic and social models that will allow both the human race and planet Earth to survive. Betty enjoys a locally grown apple donated from Mercier Orchards. At Project Chimps, we incorporate the principles of sustainability in many ways; making decisions about recycling, selecting eco-friendly products, purchasing locally, and more. One of the ways we seek to improve our sustainable practices is to grow and harvest our own food for the chimpanzees. Introducing Project Harvest. 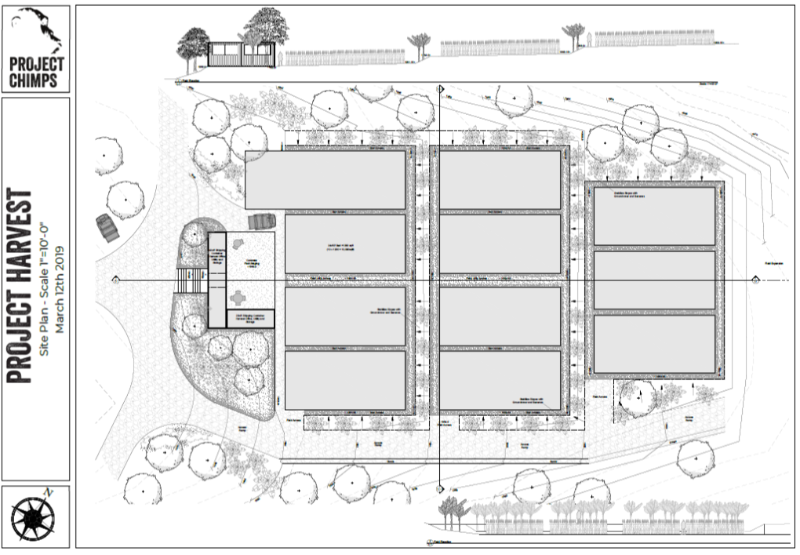 Project Harvest will be a mini farm, carving out approximately 15 acres of our 236 to exclusively focus on high-volume producing varietals of fruits and vegetables. Each chimpanzee at Project Chimps receives 5-6 pounds of produce every day; at least 7 different options are on the daily menu ranging from tomatoes, oranges, kale, sweet potatoes, and even onions. We receive donations in small quantities from local farmers and food distributors, but by and large, we must purchase the food with delivery trucks arriving three times each week. And that is just for 59 chimps! With our plan to house more than 200 chimps, we realize that we need to find sustainable off-sets to the cost and delivery burden of our chimpanzee food supply. In addition to Project Harvest, we are also tending to the edible trees and shrubs that grow on our property. These native and invasive plants allow us to provide the chimpanzees with daily “browse” clippings collected from the bamboo, sourwood, willow, and other plants that thrive inside and outside the chimpanzees’ forested 6-acre habitat. Noel enjoys red cabbage currently purchased from a local store, soon we can offer her home-grown options! Photo by Crystal Alba. By growing food for the chimpanzees right here on our own property, we will reduce our carbon footprint caused by transporting food from out of the local area. We will reduce our food costs, allowing us to use private donations in other areas. And we will be able to ensure we are not damaging the native wildlife that surrounds us by using only organic and natural pest deterrents. Most important, we’ll be providing the chimps with a healthy and varied diet! Our efforts to participate in the growing movements for food sustainability will be accomplished through our Project Harvest Committee; a group of passionate volunteers and funders who have already contributed their knowledge and early support to create the foundation of this farm area. While it is only on paper today, we hope to spend this summer grading and plotting with the goal to be planting by this fall. We are well on our way to a sustainable food program! If you are interested in supporting Project Harvest join our volunteer program or select a garden supply from our Amazon Wish List! 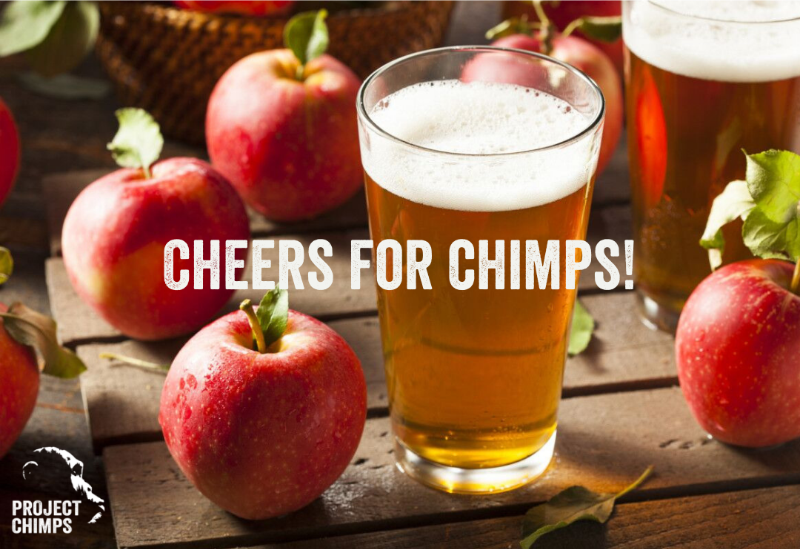 Cheers for Chimps! Join us as Fannin Brewing Company unveils a new brew to benefit Project Chimps, Saturday, April 13th, from 2 to 8 p.m.
Each ticket holder will receive a limited edition Project Chimps 16oz glass, one pour of the new apple lager and one dish of our award winning Chimp Chili with live music from Gopher Broke. Reserve your ticket here. Our first-ever Chimps Rock! is on April 26th and 27th will feature two days of art and discovery for kids and kids at heart! 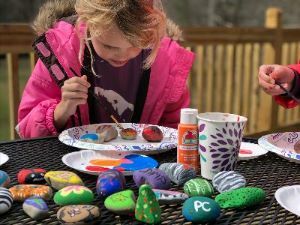 Inspired by The Kindness Rocks Project, children and adults are invited to paint a rock with messages of inspiration after touring the sanctuary and enriching the lives of the chimps. Tickets are only $10 for a child plus one adult. Secure your tickets today! At Project Chimps, we strive to enrich the lives of former research chimpanzees by giving them items that encourage their natural behaviors. In the wild, chimpanzees spend a majority of their day travelling and searching for food. Here at the Project Chimps sanctuary, our care team feeds the chimps a variety of fresh produce, the chimps don’t have to worry (like wild chimps would) where their next meal is coming from. 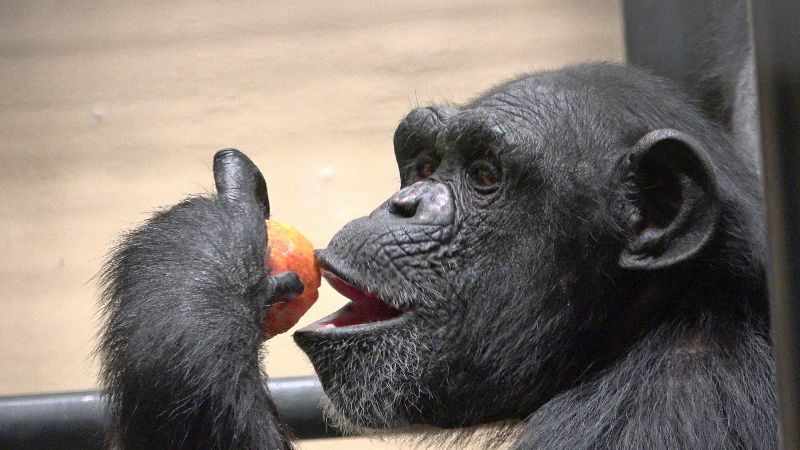 In sanctuary, the chimps’ daily diet of fresh fruits and vegetables are supplemented with a variety of healthy “snacks” that the chimps have to search for. In the sanctuary world, we call it “browse” – leaves and branches from trees and plants that in the wild, chimpanzees would be searching for and munching on all day long. 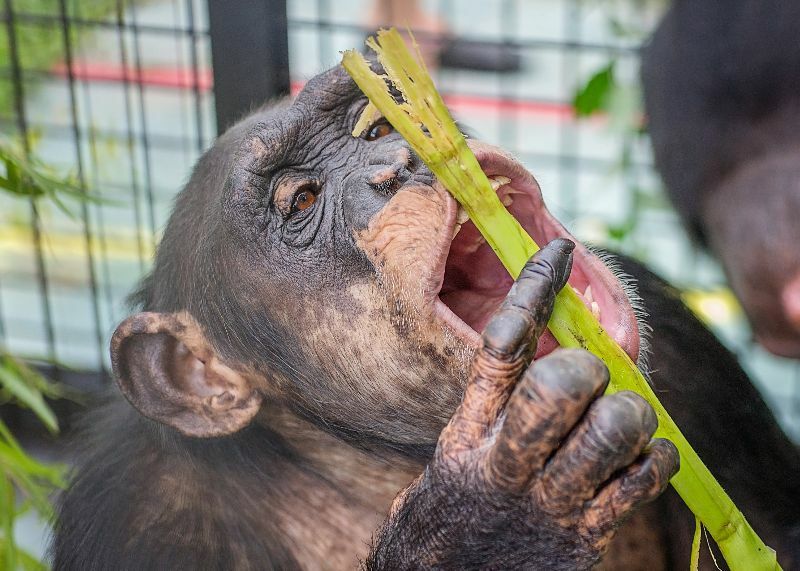 Samira chews on a bamboo stem in the mesh tunnel that connects her villa to the outdoor Peachtree Habitat at Project Chimps. Photo by Crystal Alba. Chimpanzee digestive tracks are designed to handle a good bit of fiber, so the benefit of browse for gut health is substantial. On top of hoping the chimps have happy bellies, browse also keeps the chimps occupied and challenged. Members of our team gather stems and branches from native and invasive plants that grow on the grounds of our sanctuary in the Blue Ridge Mountains of north Georgia. Chimpanzee caregivers then lay the cut branches on the tops of the mesh of the chimps’ large group enclosures so the chimps must pull the leaves through the mesh to eat, mimicking the foraging process in the wild. 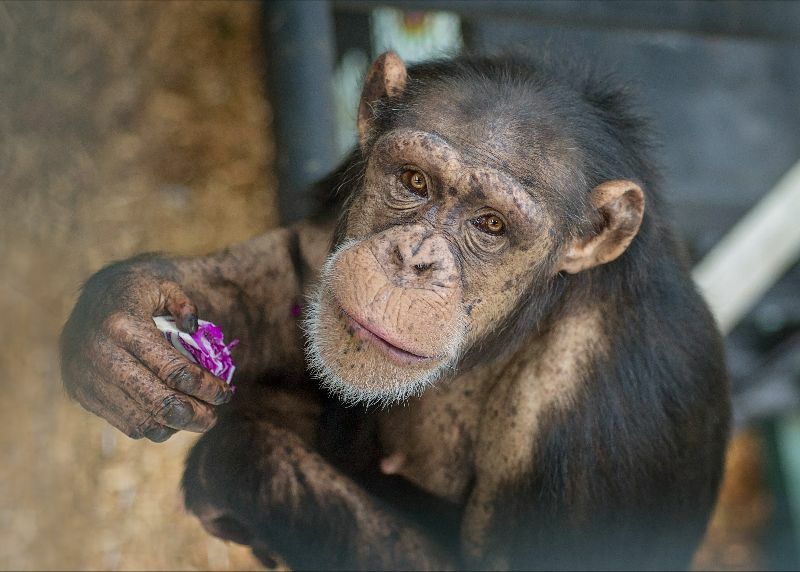 Read more about how browse supports the chimps health and happiness in this article by Chimpanzee Care Manager Laura Mayo on our Chimp Chatter blog. To support foraging activities like this and chimp care directly, make a one-time or recurring donation today. Do you know a mother-to-be? A new Project Chimps fan in the family? Get them a onesie to show their chimp love! Environmentally friendly phthalate-free soy based inks are used for the printing of this onesie. 95% Chimp design printed on front in charcoal. Royal Apparel brand. Made in the USA. Get our onesie in green!Also available in pink! Meet Ryan Kennedy, Landscape Specialist at Project Chimps. Don’t make him choose between plants and primates. Both are equally his passion. 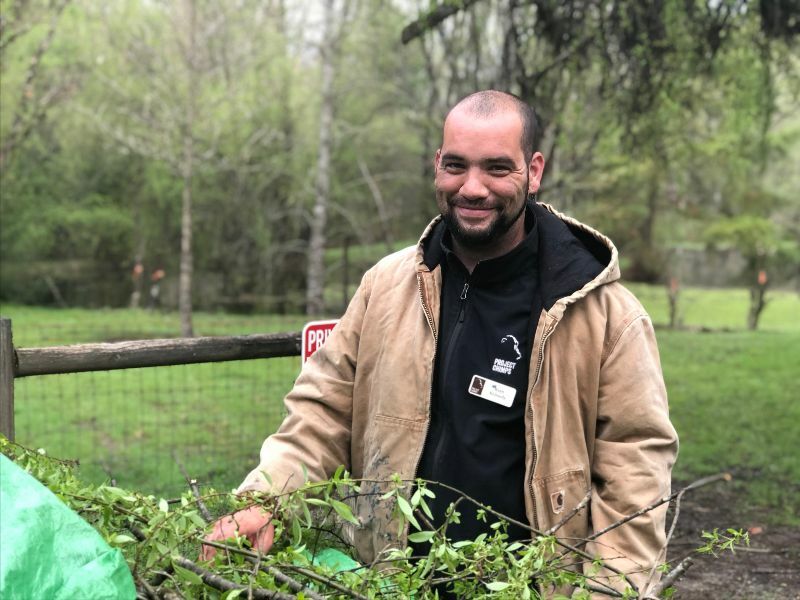 Ryan Kennedy combines his expertise in horticulture with his passion for chimpanzees in the newly created position of Landscape Specialist at Project Chimps. On any given day, you’ll find Ryan bushwhacking through tall stands of invasive bamboo or climbing ladders to carefully prune native trees. His cuttings then become a major source of enrichment for former research chimpanzees. Find out more about Ryan and how he helps the chimpanzees thrive in sanctuary on our Chimp Chatter blog.